Everyone in Hyderabad has heard of the Medak Church and if you grew up in this city it is highly likely that you would have even gone there on a school trip. It is after all the largest diocese in all of Asia and is believed to be second only to the Vatican, even across the globe! What started off as a project of true Christian compassion in 1914, to mitigate the suffering of people during the three-year famine that had hit Medak then, has brought to this district its most famous landmark. It was the missionary Rev. Charles Walker Posnett’s idea, to create employment rather than run a free kitchen and this massive church built in the Gothic Revival style that took 10 years to complete did achieve this objective. Notwithstanding the fact that the church gained its most renown for its beautiful stained glass windows – which do leave one spellbound as the sunlight filters through them into the inner sanctum of the cathedral – its most striking feature remains the 175 feet bell tower. There is more to this sleepy little town though. Telangana’s most celebrated festival, Bathukamma is performed on a large scale here. Recognised as the symbol of the state’s cultural identity, this nine-day festival is celebrated in honour of the Hindu Goddess Gauri. Yet another festival unique to this region is Peerla Panduga. It is but Muharram, only celebrated by both Hindus and Muslims alike across the Sufi Ashurkhanas here. & with the Tourism Department‘s Heritage Hotel at the Medak Fort one can enjoy the art of slow travel right here, only an hour and half’s drive away. The Medak Fort is a testimony to the history of this district. Strategically located on a hill, this fort is known to have exploited the natural topography of the area in creating an invincible defence around itself, standing witness to Medak’s significance during the reign of the Kakatiyas. This summit today offers one gorgeous views of the surrounding city. The view from the fort is not be missed. For it surely is an intriguing sight to see a city grow and flourish around Trinity Diagonal – a Mosque, a Temple and the Church all perfectly aligned in a diagonal cutting across Medak. Built around the 12th century, the Medak Fort was once a command outpost for the Kakatiya, Bahamani and Qutb Shahi dynasties and is believed to have set the scene for many a battle for over five centuries. Not much remains of the fort now, except for its three entrances – Prathama Dwaram (first entrance), Simha Dwaram (lion entrance) and Gaja Dwaram (elephant entrance). These are striking in their architecture and as their names suggest, are adorned with snarling lion heads and majestic elephants. Also standing untouched by time on the main entrance is the Ganda Bherundam, a double-headed eagle with an elephant in its talons. This mythical bird, an ancient symbol of royalty and the great Vijayanagar Empire’s insignia has since been incorporated into the present day Karnataka State’s emblem. One is then left to wonder if it isn’t but a remnant of the symbolic consolidation of the reigning dynasties of the era. 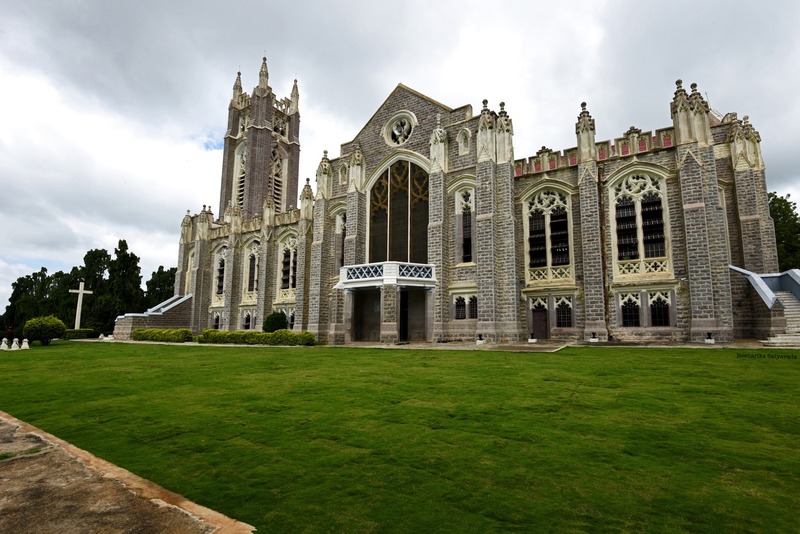 So, while planning your next road trip from Hyderabad don’t just strike Medak off your list, for there is a lot more to this district-town than just its record holding Church. Route: Take the NH44 via Kompally to get to Medak. Stop By: The road to Medak goes through the Narsapur Forest Range and you will find a horde of monkeys lined up all along the road. So don’t forget to carry some bananas to feed these guys. They are so accustomed to this that the minute you slow your car they will stand up and look into your window to see what snacks you have got them! Yes, agreed. Really well done story. You are so good at spotting hidden gems! Your lens is able to capture the beauty that remains concealed to ordinary eyes. Thank you. 🙏🏻 I was really fascinated when I noticed how they were aligned, so from there came the idea of Trinity and the post title was stuck in my head since then!